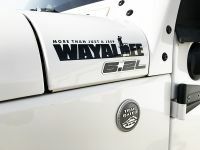 Show your support for the Jeep WAYALIFE by adding a decal to the side of your rig! This is the all new Vista Decal and as you can see, it's similar to our classic cowl decal but in place of the letter "I", it now features an adventurer standing in his Willys, shielding his eyes from the sun and looking far out toward the horizon. Decals are sold individually so please be sure to indicate a quantity of two when checking out if you're planning on adding one to each side of your rig. Price for decals includes the cost of shipping and handling in the USA. Available in black or silver.